This aromatherapy technique integrates the application of 9+ therapeutic-grade essential oils with integrative massage techniques to loosen the musculature surrounding the spine and shoulders. It supports the immune system against foreign invaders, and helps reduce the presence of inflammation and pain. These deeply penetrating oils detoxify and nourish every system of the body. (60 Minute Session) Includes application of essential oils along the spine with hands, feet, or neck massage while the warm towels are setting. (75 Minute Session) Includes application of essential oils to the spine, warm towel application followed by massage therapy on focused areas of tension, pain or discomfort. (75 Minute Session) Includes application of essential oils to the spine. While warm towels are setting, a cranio-sacral adjustment and facial massage using oils to support the respiratory and immune system. This treatment is perfect for recovering from head cold, stuffy head, or sinus infections. (recommended for someone who needs a higher dose of oils for heavy duty action). 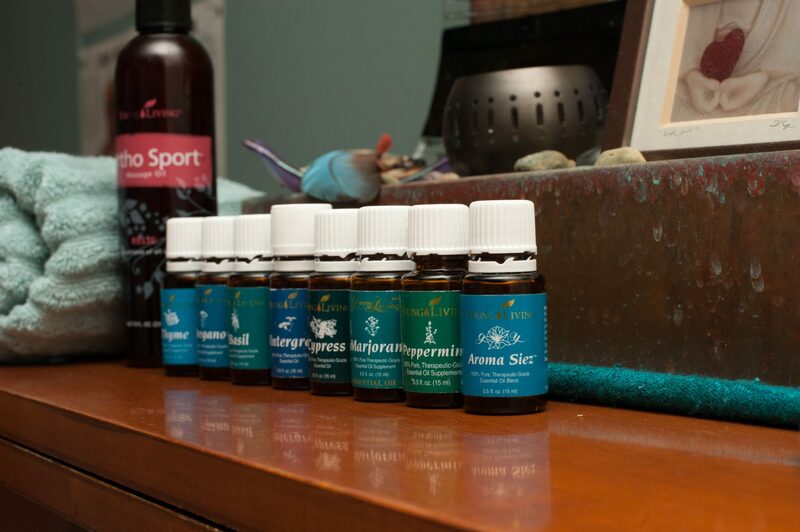 The proprietary blend of Young Living’s Therapeutic Grade Essential Oils selected for a Raindrop Treatment include 9 Oils – 2 blends, 7 single essential oils and a massage oil in a vegetable oil base. In the collection, there are oils selected to support each system/structure of the body – circulatory, immune, bones, muscles, etc. Additional oils can be added to the treatment for specific ailments, such as eucalyptus for respiratory issues. Aroma Siez (blend) – An advanced complex of anti-inflammatory muscle relaxing essential oils that promote circulation and treat spasms, tight, inflamed, aching muscles, resulting from injury, fatigue or stress. Also relieves headaches. V-6 – A complex of nourishing, antioxidant rich vegetable oils that is colorless and odorless. It is an ideal carrier oils for essential oils. Contains: fractionated coconut oil, olive oil, sesame oil, almond oil, sunflower seed oil, wheat germ oil.